Procrastination is going to be the death of me. I have known what I wanted to make within a day of the ingredient polls closing for this month's Crazy Ingredient Challenge. Actually, I had two ideas - a cake and a bread. I was actually most excited about the cake. But thought I'd go bread just based on the fact that the other things that I wanted to make were also dessert. I got my pineapple and rosemary pretty quickly and I was ready to bake. But things just kept getting in the way. Suddenly, it was the Friday afternoon and I hadn't started my bread yet. I wasn't too worried though. I had never tried the recipe before. But I was sure (hopeful?) that the pineapple and rosemary would work well. Additionally, I thought I'd paid close attention to hydration while I was planning the recipe. There shouldn't have been any surprises. The dough gods were just not on my side. The dough was STICKY! It made no sense. I had added only half on my planned liquid. How could it possibly be so sticky? Where did I go wrong? Keep kneading? Keep adding flour? Eventually, I tossed the sticky mess into the fridge for a slow, cold rise and decided that it was time for a new plan. I didn't want to start the bread recipe over. At that point I didn't know what went wrong. I decided to go cake. The original cake plan actually involved caramelizing pineapples. I know - so good! In my panicked state, I completely forgot about the original cake and decided to go with a coffee cake instead. The coffee cake is good. Even better with way too much glaze on top. But I'll be honest, I want my caramelized pineapples! I still could have gotten it done. This coffee cake plus caramelized pineapples would have been pretty awesome too. But I had a meeting to get to and I was running late. And I HATE being late and having people wait for me. I'll bake the bread at some point today and will share how it turned out. My best guess at the crazy hydration is that I added too much sugar. I remember now that there was a question mark beside the weight of the sugar and that meant that I needed to think about adjusting it. Clearly, I didn't. Sugar will pretty much act like water in your dough. Try it sometime. Add a ton of sugar to a dough of perfect consistency and then watch it become very hydrated. The other issue could be weather related. Ah, bread baking is so fun! Seriously, it is. 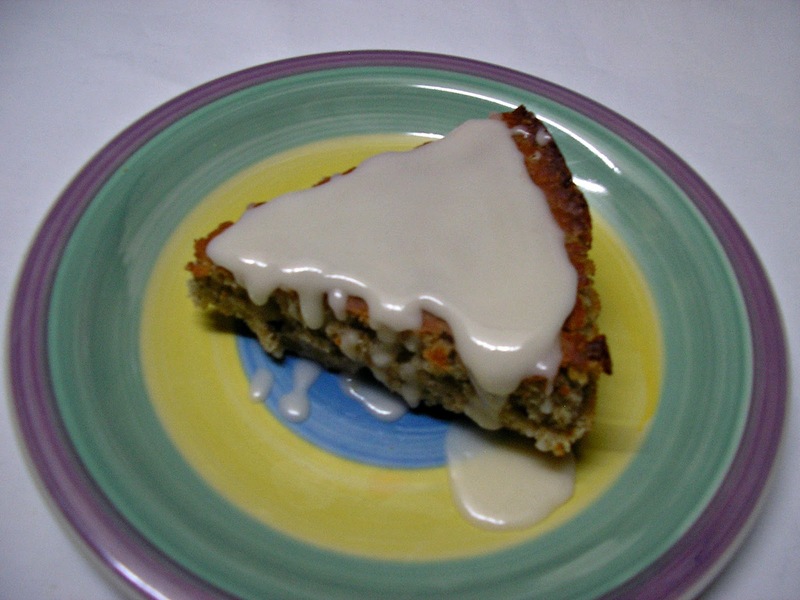 Until I bake my bread, I have coffee cake with way too much glaze to eat! 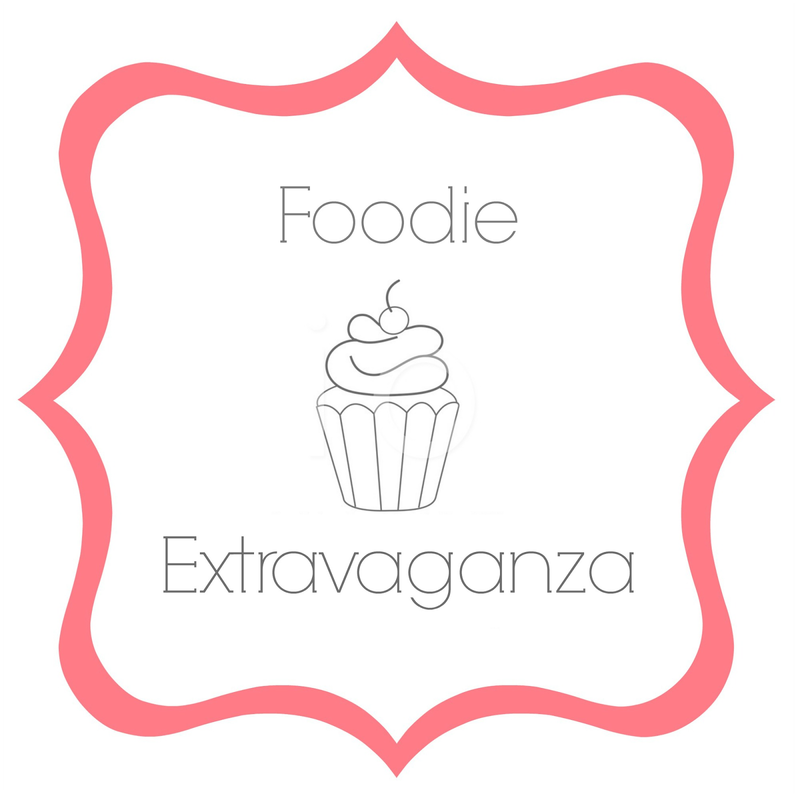 Be sure to check out what all the other bloggers made with pineapples and rosemary. Whisk together half the flour, yeast, sugar, rosemary, cinnamon and salt. Add the butter to the warm water then pour into the flour mixture. The butter does not need to be completed melted. Stir in the beaten egg. Beat for 3 minutes. By hand, stir in the pineapple and the remaining flour a little at a time. Pour into a greased 9 inch square or 9 inch springform pan. Cover and let rise until doubled. Prepare the topping by mixing the sugar, flour and cinnamon. Finally, mix in the butter until crumbly. Gently sprinkle oven risen batter. Bake 35-45 minutes until golden and the cake registers at least 190 F.
If using a springform pan, be careful of leaks. Wrap the bottom of the pan with foil or place the pan on a baking sheet while it's in the oven. I used a 9.5 inch springform pan which is a wee bit too big. A 9 inch cake pan with 1-2 inch sides might be too small. Three inch sides would work. I struggled with whether or not to share this bread and if I did share it, I had no idea what I would call it.Let me explain. I set out intending to make a yeast risen cake. They are my latest obsession. Well, the obsession really started because I ran out of baking powder one day and I thought that it was time to test out yeast risen cakes. It also seemed perfect for our lemon theme in Bundt Bakers this month. (Thanks for hosting Anne!) I drew inspiration from several yeast-risen cakes that I saw around but particularly from the Polish babka. 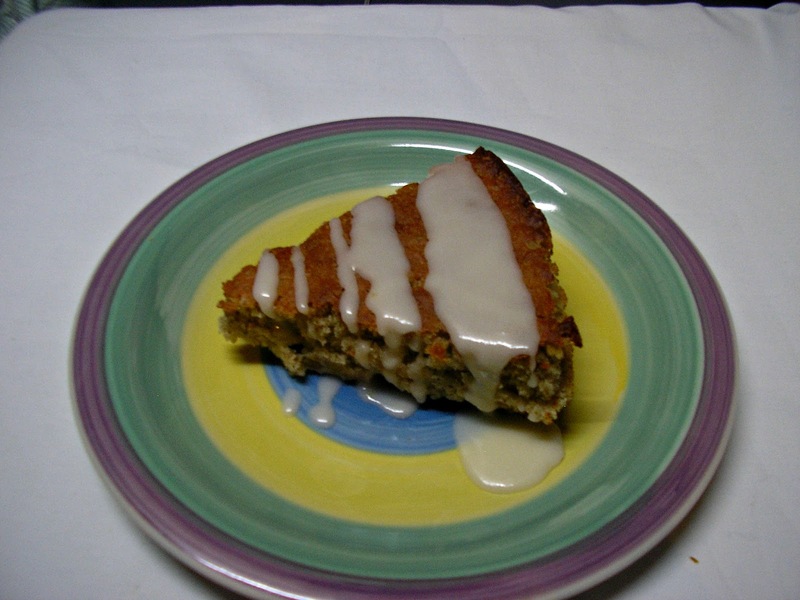 I loved the crumb that I saw on a couple and I adapted the recipes hoping that I would have the same. The addition of rosemary was because it was the herb of the week for me. Months ago, when I first pondered this, I thought basil would have been the winner. But it got edged out by rosemary. The smell from the oven was just amazing; I knew that I had made a great choice.The dough had quite the oven spring and rose way above my ten cup Bundt pan. I impatiently waited for it to cool so that I could get a slice. Finally, I did. And I was disappointed. What I had was definitely bread - not cake. On that cake -bread line, this wasn't even near the middle. Dejected, I sat down to make notes on what to change for the next iteration so that I could get a more cake-like crumb. I nibbled on pieces as jotted in my notebook. At one point, I looked up for something. That's when I realised that I had eaten almost half of bread. It was clearly delicious. It needed to be shared. 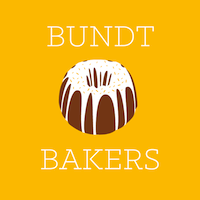 But with the Bundt Bakers? And if yes, what would I call it? When half the bread was gone, and I still hadn't made up my mind, I realised that it would be detrimental to my waistline to make another lemon-rosemary "hopefully-cake-this-time". This was definitely worthy of sharing with the Bundt Bakers and I would just have to figure out a name while I went for a long walk to prepare for the remaining half. The bread is unbelievably soft. Shreddable soft. I absolutely love it! It's much too delicate for French toast; though I think a dip in a coconut custard would be heavenly. Maybe if I let some pieces get a wee bit stale? Perhaps. But I did lightly toast a few slices. So good. I'm still disappointed that I didn't get the cake that I was craving but this bread more than makes up for it. Plus, I really shouldn't be that disappointed since I make a microwave mug cake almost every single day. My cravings are being satiated.And this just means that I get to bake a layer cake just because it's a day that ends with a "y" pretty soon. 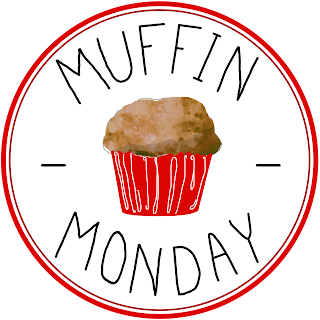 Be sure to check out all the lemon cakes below! Recipe by: Kelly Adapted from: Are You Cooking? Stir flour, yeast and milk together. Whisk until smooth. Cover and let sit until doubled. This will happen pretty quickly as there is a lot of yeast. Don't go too far! Rub the lemon zest into the sugar to help release the oils. Beat yolks and lemon sugar until thick and pale yellow. Add all of the sponge and the rosemary and beat until combined. Slowly stir in the flour and salt. Beat with a paddle attachment for 5 minutes then drizzle in the melted butter. Knead for about 5 minutes or until the dough glossy and pulls away from the side of the bowl. It's fairly sticky! Cover and let sit until doubled. The time it takes will depend on the temperature of the room. Estimate 30 minutes to an hour if it's relatively warm. Grease a 10 -12 cup Bundt pan and preheat the oven to 350 F.
Distribute the dough evenly in the pan and once again, let it rise until doubled once more. When the dough is ready, bake for 15 minutes at 350F then lower the temperature to 325F. Bake for another 20 - 30 minutes or until the bread registers at least 190F. Allow to cool for 10 minutes then turn out onto a cooling rack to cool completely. Try not to cut it while it's still hot! 2 tablespoons of rosemary gives it a subtle rosemary flavour. You can definitely smell it though. Bump it up if you want more. Lemon extract could also be added to boost the lemon flavour. 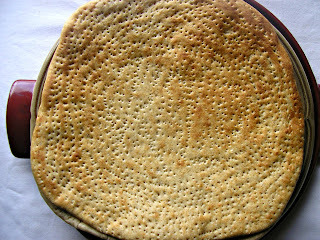 This month the Bread Bakers are making flatbreads. 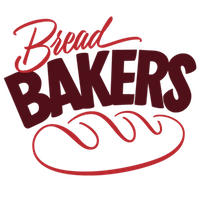 As I sat thinking about what to make, I could not help but feel jealous of the cultures/countries that had amazing breads. For Jamaicans it's hard dough bread, coco bread and our Easter bun (a loaf version of a hot cross bun). There may be some roti sprinkled here and there by those with Indian heritage. Certainly not the 1001 (slight exaggeration) different types that I saw in some countries. Fine, we're a small country. I guess I need to expand and look at bread across the Caribbean as a whole. I could be missing out. In undergrad, I remember being excited watching my Trinidadian friends make roti. I had a tawa at home but never saw my mother use it. 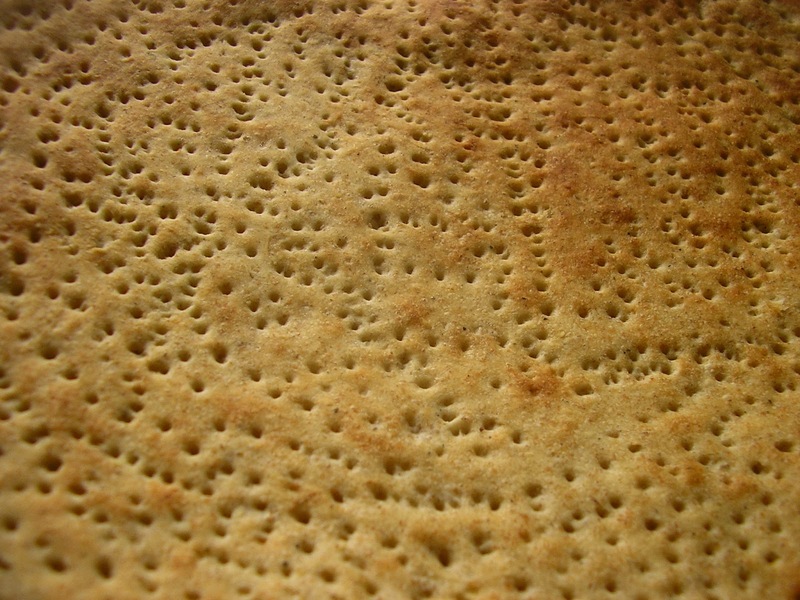 When I went home for the holidays, I quickly got into the kitchen to try making roti for the first time. I made some really delicious crackers. I tried roti again years later. And while it was softer, it still didn't have that roti flavour. And most troubling for me was the fact that I couldn't get my dough to puff up. I needed that puff to make great paratha. That puff would remain elusive. 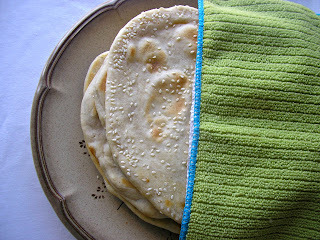 Despite my puff deficiencies, I thought I'd make sourdough pitas for this challenge. I woke up my barely used starter and kneaded a lovely soft dough. I had high hopes. I tossed them in a hot oven and waited for the puff. No dice. There was some mini puffing. But I wanted a balloon. Later, I realised that I had not let my dough rest after rolling it. That might have helped with the ballooning. 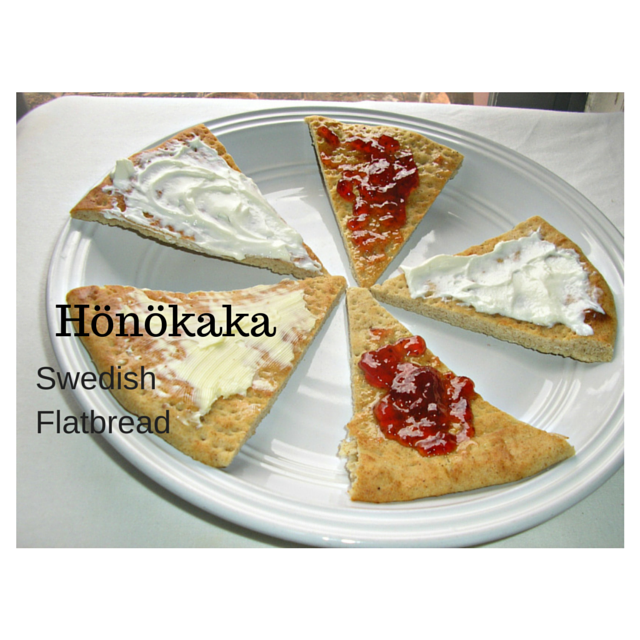 I would have tried again but then I got distracted by a Swedish flatbread called hönökaka. The dough is a mixture of flour, rye, brödkryddor (bread spices - anise, fennel and cumin) and yeast. But the ingredients were not what caught my attention. It was the spiked rolling pin (kruskavel) being used to roll out the dough. In lieu of a kruskavel, the Swedes use a special 8 pronged fork. I have neither a kruskavel or a spider fork but I will happily poke a dough several times with a regular fork. I'll even put in my initials. I'll be honest, I didn't think much about the flavour of the dough. I'm sure the brödkryddor would have had added a little something. But I was so focused on poking my dough that I honestly didn't think about it. I was pleasantly surprised when I bit into a still pretty hot hönökaka fresh from the oven. So soft and absolutely delicious. 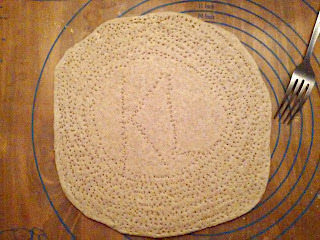 I kicked myself for halving the recipe and quickly ate an entire 11 inch round. Halfway through, I thought it would have been even better if I added some kinda topping. 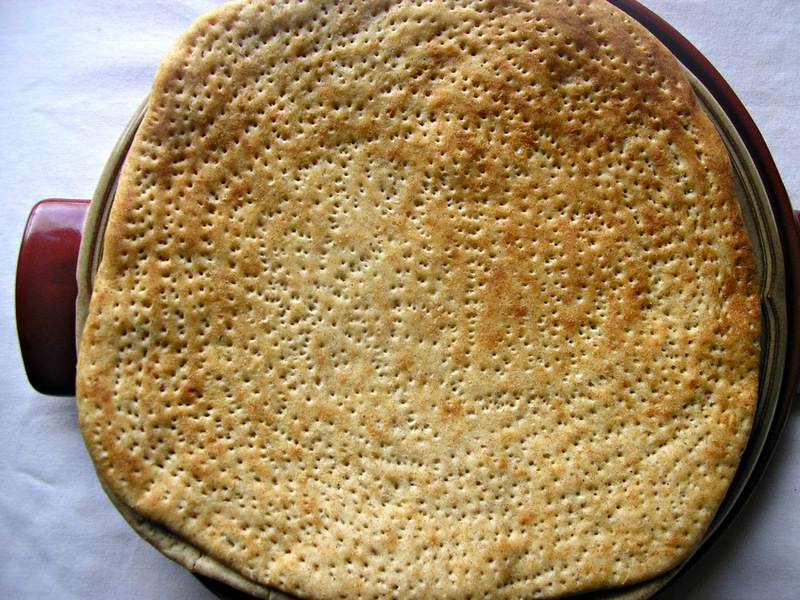 Be sure to scroll down to see what other flatbreads the Bread Bakers made this month. Thanks for hosting, Mireille! For the brodkryddor, grind together equal parts anise, fennel and cumin. In a large bowl add all the dough ingredients except milk. Ensure that the salt is not poured directly on the yeast. Slowly add the milk and knead until you have soft, tacky but not sticky dough. This could take about 3-5 minutes in a stand mixer and a little longer by hand. Form the dough into a ball and place in greased bowl. Cover and let rest until it has doubled in size. The amount of time this takes depends on the temperature of your room. You could also let it rise overnight in the refrigerator. When the dough has risen, turn it out onto a floured surface and knead lightly. Divide into 3 round balls. Flatten each to a 6 inch disk. Cover and let them rest for 30 minutes. While the dough is resting, preheat the oven to 475 F. Place a metal baking sheet or pizza stone to preheat on the top rack. Take a disk a roll out it out to about 1/8 inch using a kruskavel or a rolling pin. 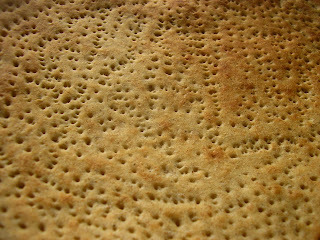 If not using a kruskavel, after rolling, use a fork to poke holes all over the surface of the dough. Quickly slide the dough onto the baking sheet or pizza stone. Bake for 3-5 minutes or until lightly golden. 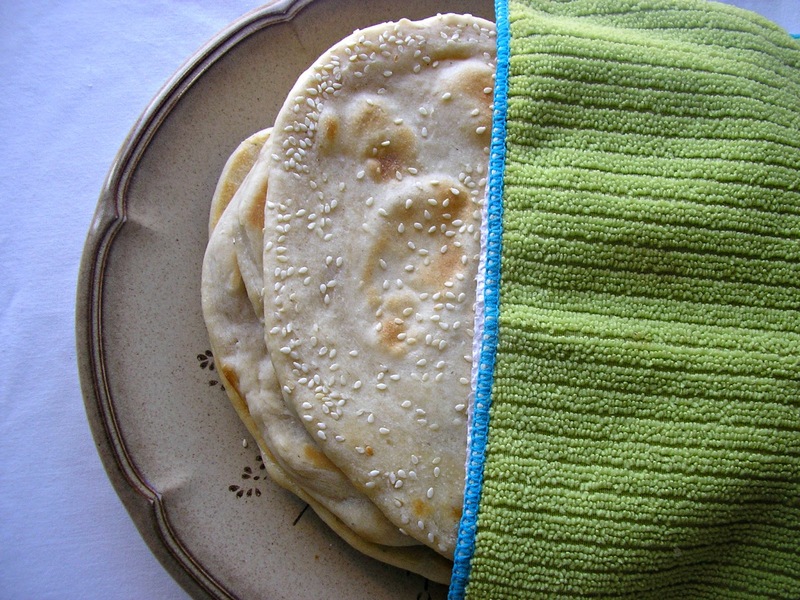 When baked, place on a cooling rack and cover with a towel. Repeat with the remaining pieces of dough. Slice into wedges and serve warm honokaka with toppings of your choice. Swedish Food suggests butter, cheese, jam, honey or pickled herring. The recipe called for more milk which would have led to the dough being above 75% hydration. There's no way I could roll that out. I used ~60% hydration here but in cooler weather, I would go as high as 65%. Lately, I've been trying to make more things that remind me of home. It's, however, not that easy to find something that fits into each group's theme. For Foodie Extravaganza this month, we're celebrating eggs. That should be easy, right? Not quite.I wanted a dish that used eggs as an integral part. But I couldn't think of anything Jamaican that did. I thought I'd have to go with our neighbour to the north (Cuba) and make a flan. I was ready to start being when I came across a macaroons recipe. Flan went out the window. Let's be clear. There's nothing remotely Jamaican about macaroons. Nothing. 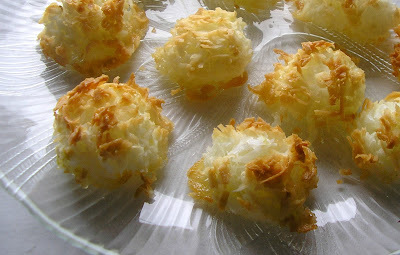 But macaroons are my mother's favourite cookie and a cookie that I need to master before I see her next. She loves all things coconut so I could always distract her with another coconut item (it was a coconut cheesecake the last time). But I really want to get better at cookies, in general. I added ginger because my favourite coconut treat is a simple mixture of ginger, coconut and caramelized brown sugar (drops). If I were stranded on a deserted island, I'd probably figure out how to make coconut sugar and so I could make drops. Be sure to scroll down to see how others are celebrating National Egg Month. Heat oven to 325 F. Line a cookie sheet Ruth parchment or a baking mat. Beat egg whites, sugar and salt until foamy and the sugar has dissolved. Stir in the coconut and grated ginger. Drop rounded tablespoons onto the cookie sheet. Bake 17-20 minutes or until set and lightly browned. Immediately remove from cookie sheets. I like a lot of ginger and two teaspoons was not enough for me. It was just mild. Feel free to use more!